What is a novel anyhow? A reasonable question to ask your students as a semester goes along, since it seems to be a long form of prose that comes to dominate what we now consider literature. If one is to believe Amazon Rankings, then the most read forms of electronic books and the most purchased books remain novels (at least when I wrote this, but I’d be surprised if it changes). This wasn’t always the case and part of the history of the novel is its commercial success. 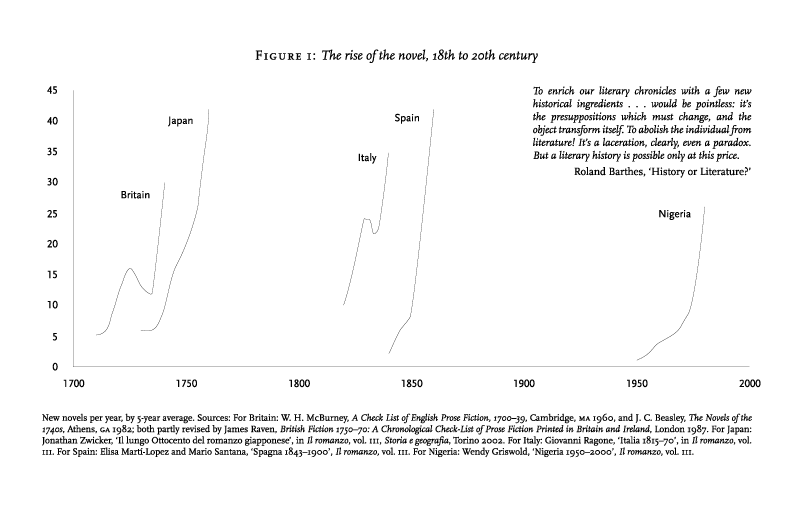 Franco Moretti makes the case clear in his Graphs, Maps, and Trees where he argues that the rise of the novel can be studied using charts, as he does in his previous work Atlas of the European Novel (Moretti’s response, which is more useful.) Building on the idea of charting large-scale phenomena over time, he notices that novels rise (fig. 1). Something about the form, the markets, the people, or something else means that this particular literary form comes to dominate, so whatever time period you consider, it’s worth considering what was going on. Its well established that the English novel rose first—the form seems to have been invented there—so even in a non-English classroom, it’s worth considering how those novels were imported into a broader literary discourse. Luckily, the text of most eighteenth-century English novels are freely available online. We have a fortuitous confluence of the intellectually important materials that have become technologically available (a careful reader will note that this is one possible explanation of the novel’s rise as well). But, how can you study the features of a whole genre? An easy way is to read them by putting them on your syllabus, which I encourage, but after reading them you can look back at the whole syllabus and chart the topics that come up. To test this idea, I presented for Taylor Walle in her English 335 “Radical Jane: the Politics of Class, Gender, and Race in Austen’s ‘Polite’ Fiction.” Her course asked students to think about how English novels formed identities and related to the growing issues of British society. It seemed like a great chance to try some topic-modeling across her entire syllabus, the chart was produced with ten topics across the whole class (fig. 2). You can see the lesson here if you want to reproduce the work. As far as the course goes, the first topic seems to cover what all these texts have in common, but notice everything isn’t perfectly lined up by novel. The topic beginning “julia marquis door” clearly comes from Sicilian Romance, but also hits on some later chapters of Northanger Abbey. Why would that be? Well, if you know the texts, you realize that some of the same Gothic themes occur in both texts and they use the same words.—“Dear students, can anyone bring us to where in the text this happens?” And, we enter the realm of the normal literature classroom. By presenting a broad view of the texts, built by a computer algorithm, but out of the words of the text, we invite students to re-read works. Not-reading becomes re-reading and presenting words across the entire corpus puts students into partnership with technology to ask what it is about the form of novelistic prose that makes it popular and speak to social issues. Furthermore, we also encourage students to be critical of the results of computerized analysis. Several students noted that these topics were obvious, having read the works, and that they could have come up with them by hand, which is—of course—true. It’s easy to scale these up beyond what you could do by hand, but seeing how they reflect what is accurately in the text shows that they provide some purchase on truth and also suggests what might be going on with other computerized analyses. One way we imagined it was that the computer applied an obvious rule at a fine level of detail. If we follow the same method, but only for Emma by paragraph, we get a much messier chart (fig. 3), but seeing that chart, students can begin to engage with both literary texts and computers that help them to not read—to ask what it means and what can be done with it.